Anyone who has spoken to me about my wanderings round Scotland, or has read this blog for a while, will know of my fascination with old routes. There's something about the history of them and the decisions that were involved in their creation and direction that catches my imagination. Amongst the most evocative are the old "military" roads mostly ascribed to General George Wade, but often created by his successor, William Caulfield. Many of these old roads still follow the most "logical" way of traversing the countryside and so remain an excellent resource for those of us on foot or cycling and who wish to avoid the modern highways. I've recently been looking for a good off-road route from the Cairngorms into Inverness and it was inevitable that the old Wade road would come into my sights. I'd also been asked by Scotways to report back on the current condition of the road north of Moy so I had an ideal incentive to undertake a bit of surveying. I've previously written about the section of road from Aviemore to Tomatin here. In essence, it all works really well as a walking or cycle route until the downhill section into Tomatin. Here, the old road is completely overgrown and moss-filled requiring a short detour over the adjoining fields. From Tomatin, the old road has been almost completely overlaid by the railway and the various alignments of the A9 until the small village of Moy is reached. From here, the start of the route is handily signposted and goes to Lynebeg and Lynemore via a crossing of the A9. After a short distance on a good track, the Wade road can be seen heading off to the right. It's little more than a depression in the ground in some places and where there is an embankment on both sides the inability of water to drain away has resulted in some significant standing bogs - mostly quite shallow though. When the forest becomes more visible the gate ahead allows access into a narrow clearing. Just before this meets another good forest road, it's necessary to cross a wee burn. There are no obvious signs of a bridge here so there's a chance that the burn has swollen beyond its previous flow as a result of the surrounding forest. The new track now hides the original surface from use but it's a good route, high enough up the hillside to give some airy, open views. Around midnight on 16th/17th February 1746, Lord Loudon, the Commander of the Hanoverian forces in the north, mustered 1500 troops from the Inverness Garrison and set off on the twelve mile march south along General Wade’s Road to Moy in a bid to capture Prince Charles Edward Stuart. The prince, a guest of Lady Anne Mackintosh (Colonel Anne) at Moy Hall, had arrived with a small guard of 50 men, some distance ahead of his retreating Highland Army. Pitch darkness interspersed with flashing lightning slowed and unsettled the marching men. Watching the road here, 3 miles from Moy Hall, was an ‘outer guard’ of just five Jacobites led by Donald Fraser, the Moy Blacksmith. He had chosen a spot where he could observe movement on the skyline to the north in darkness, and where he had cover to the south in daylight. Nearby to the east, peat stacks remained out on the moor. Here he planned to harass, and perhaps deceive, the enemy. As the Hanoverian Column, spearheaded by the Laird of MacLeod and his men approached in the darkness, they were surprised by sudden musket fire and loud war cries urging clansmen to battle. Even the peat stacks threatened in the flashing lightning. Convinced that the whole Highland Army was at hand, Loudon’s men turned in panic and fled back to Inverness, somehow carrying off the body of Donald Ban MacCrimmon, Piper to MacLead and the only fatality of the night. A premonition of his imminent death had been realised. As the road goes downhill again it has to veer off the Wade route due firstly to the A9 and then due to some quarry workings. For the real Wadeophiles it is, however, worth making a short detour along the original route to see the old bridge over the Midlairgs Burn. Go much past this and you'll come up against the quarry gates with their rather prominent warnings of imminent death! Continuing on the re-aligned road it's not long before the farmhouse at Auchbain is passed then we pick up the Wade route outside the front entrance to the quarry. There's a short section of tarmac, before a right turn onto the B851 road to Farr and then an immediate left to the bridge at Faillie. This is a typical, steep bridge and the road surface at the summit is well marked by the passage of low vehicles. From here, the route gets a little difficult to find, mostly because of the recent housing developments. Eventually, I spotted a sign hidden in the bushes where the current road seems to have been widened to accommodate a lorry turning. The problem now is that there is a huge embankment to climb up - difficult enough on foot and more so dragging a bike. That's the RoW going up the embankment on the left. I actually repositioned the sign after this photo. This re-aligned section carries on to the back of a modern house then joins the original route uphill through a very overgrown section between a field and a fence. It's not hard to see why this has been left to the undergrowth as the gate at the top has been locked (not sure this is legal if it's a Right of Way), thereby restricting passage. It was just about possible to find the track through this vegetation. The locked gate doesn't help. With the proliferation of shrubs and long grass, combined with the steep angle, this became a bit of a push rather than a ride. Beyond this gate the track is visible as a field boundary, carrying on in a straight line to the minor road through another gate (unlocked this time). Crossing this road there's an obvious, signed march through the woods with dykes (mostly well overgrown now) lining the route. The alignment is obvious the whole way as it's almost arrow straight and continues through Dundavie and Daviot Woods on a mostly good surface until the crest of the hill is reached and there's a change in the air as you start descending to the outskirts of Inverness. From the top of this restricted access lane, it's a fast descent down to "civilization" and the big city. All in all, I'm pretty happy with the route. If anything, I think it works better going South where the one possible pushing section north of Faillie is therefore rideable. I can imagine that the last section of singletrack into Moy itself could be horrendously boggy at certain times of year but it's all typical Scottish mountainbiking. This links up pretty well with the section from Tomatin to Aviemore, providing an almost exclusively off-road route all the way to the Cairngorms and beyond to Kingussie and Newtonmore. As for my day out, I really enjoyed tracking down the old road. In places, the original alignment has been bypassed altogether and is sometimes easily missed (in fact I think I've subsequently spotted an "orphaned" section on the east side of the A9 south of Auchbain). A combination of map reading, aerial photography, on the ground assessment and, sometimes, downright wishful thinking, seems to bring the route alive and it's not too hard to imagine yourself in George Wades head, seeing the land as he saw it and trying to decide where his road should go. In places, it has survived remarkably well. In others, centuries of non-use have made it almost impenetrable. Either way, it still stands as a remarkable achievement. I'm getting a bit more fussy in my old age. Whereas I'd once wander the aisles of Tisos or Nevisport, eyes agog at the wonders contained within, I rarely visit such emporia these days. I'm sure there are still lots of wonderful new things to be discovered but I just hate the whole experience and I seldom see anything that exactly matches what I'd spend my money on. I put it down to developing more preferences, knowing from experience what works - and what doesn't - and not wanting to compromise. This change has been accompanied by an explosion in availability of some very well-designed kit from many small manufacturers, made available through the wonder of internet shopping. Of course, it's always a risk shopping like this. You can't inspect the quality of the goods and things like fit, comfort and "feel" are only possible to check once the goods are available in the flesh. However, it's often worth the risk of a poor purchase to get something that's just what you were looking for. A couple of years ago, I bought myself a new (actually, secondhand) tent. It's a Scarp 1 and has been great for some all-season camping. It's pretty lightweight compared to some of the tents I've used before. It's a bit fussy when pitching and needs a decent flat area to get it just right but it's pretty bomb-proof and very cosy in colder weather. I then decided to try out bivvying. This has worked better than I'd hope. The flexibility of not having to peg anything out makes short overnight stops very easy. Couple that with a small tarp and you get a bit more shelter and somewhere under cover for cooking etc. It's still a bit cramped though and I reckon I prefer a bit more shelter from the elements when the weather isn't too great. 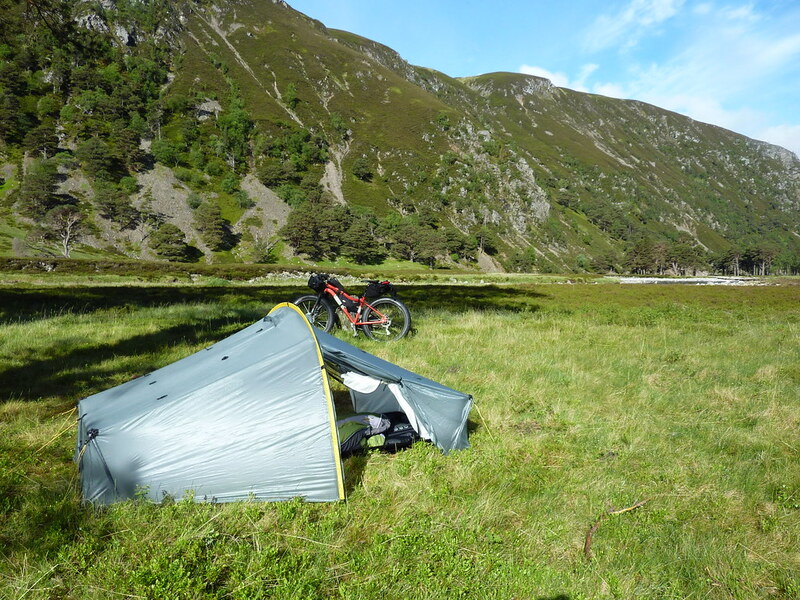 Bivvy bag and tarp above Kinlochleven. Bike being used as a support. So - I got to thinking about what would be a great combination of the two systems. I imagined a tarp that was a bit bigger, with a pole to give some height. It would have a midge-net built underneath it, linked to a suspended bathtub groundsheet for bug-free sleeping. Ideally, the door would be longitudinal, giving a decent sized porch for gear storage and cooking. It would need to have great ventilation to avoid the build-up of condensation we so often suffer from in our climate and it would, of course, be ultralight. Luckily, someone pointed at the Six Moon Designs website and the Lunar Solo tent. Here, it seemed was my design made real. After my usual bout of swithering, several months later I ordered it from backpackinglight.co.uk and today it arrived. Midge-net "walls" can be seen at the back. The entire front is also medge-net. I've obviously not had a chance to try it out yet. The seams will need to be sealed and I'll want to experiment setting it up a few times to see if there are any snags. However, it seems to match my list of requirements pretty much 100%. I bought a very lightweight carbon pole to go with it but a normal walking pole can be used instead if I'm hiking. It's certainly very lightweight. At just over 700g (including pole and pegs), that's less than my tarp and bivvy bag combined. Internal space is very good - especially as I'm only 5'7" - and there's enough room to get some bags inside with me as well as more space under the porch. The only issue with the latter is that it's quite high off the ground so anything underneath it couldn't be guaranteed to stay dry. It'll also need careful pitching to ensure that any wind is coming over from the rear. 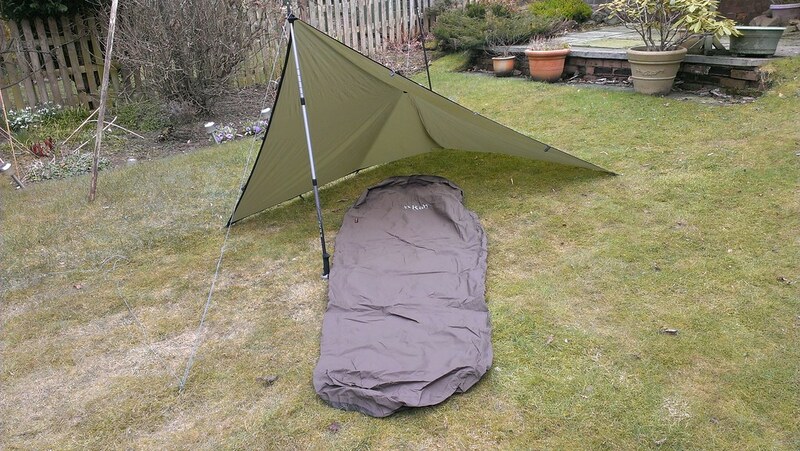 I reckon there are a few more nights of suitable weather this year before I might need the extra shelter of the Scarp and I'm really looking forward to trying it out.